I have a mental list of people that I'd love to make special cookies for. Every so often, I get a small break in the schedule and am able to work on shortening that list. 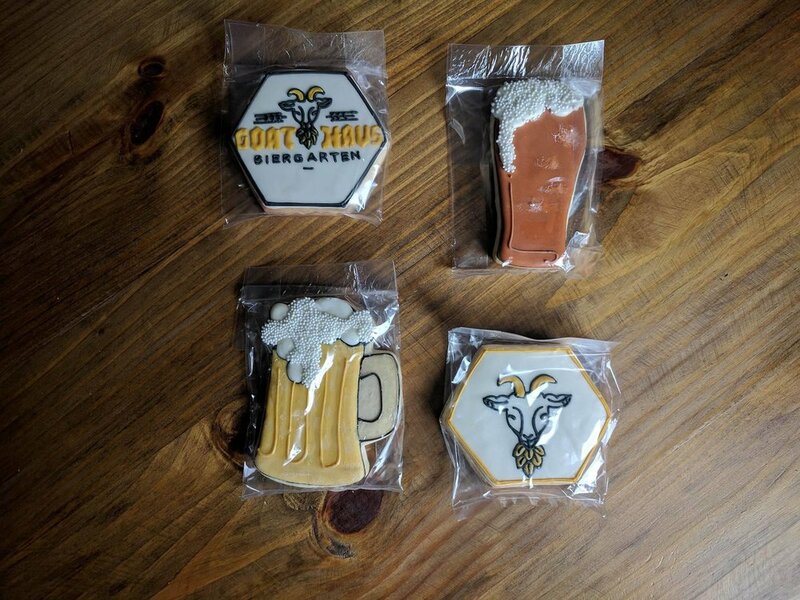 Last summer I took the opportunity to make my friends, James and Adam, from Goat Haus Biergarten, a special set of celebratory cookies for the then recent opening of their new business endeavor. When I first saw their logo, I knew that I had to put it on a cookie. I tend to see the world in with different eyes now and some things or images just scream "Put me on a cookie!!". Anyway, I was excited to get started and send them on their way. I always ship with the USPS, Priority 2-3 day shipping so I had an idea as to when I would be hearing something from them. I figured I would get a text or message from either James and/or Adam upon receipt but a few days had passed and I hadn't heard a thing. Knowing that if they had received them, there was no way that these Southern Gentlemen wouldn't reach out to say thank you. So I figured I'd better look into it just in case they never arrived. Apparently, they weren't delivered and were sitting at the post office awaiting pick up! I had really wanted these cookies to be a surprise, but I needed to touch base and let them know that I had sent them a package. Long story short - I messaged the guys and let them know that I had sent them cookies and that they were at the post office. A few days later, I still hadn't heard anything so I figured that I'd better check back with them again. It had been almost a week since delivery. 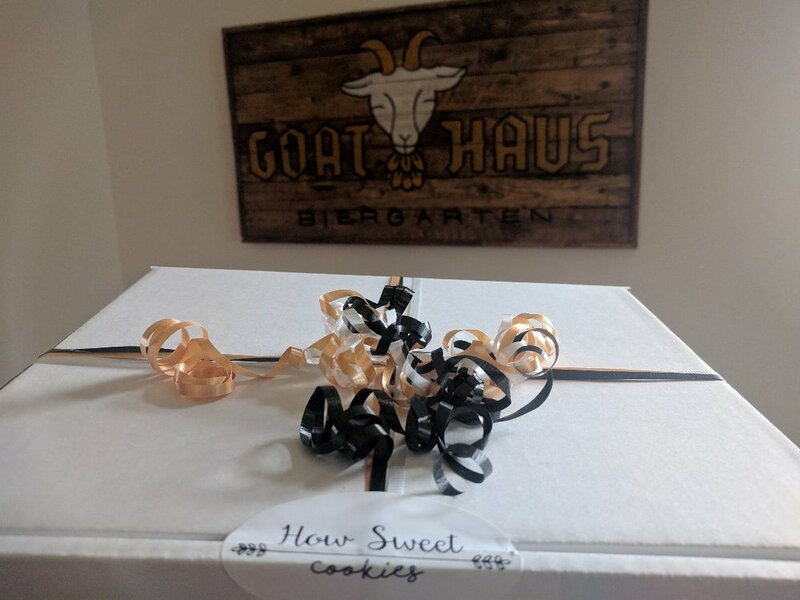 I sent a message and added a few pictures of the cookies this time. I was worried that 1.) the cookies would be gone or 2.) they would be damaged. I quickly received these next photos assuring me that all was well and the cookies were finally "home". I didn't even see the cookie with a missing bite sitting on top of the sign. When I did, I literally laughed out loud! 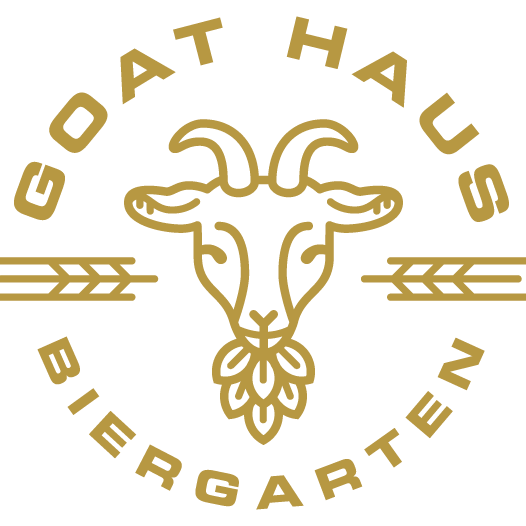 If you are in Montgomery, AL or somewhere nearby, make sure to stop by the Goat Haus Biergarten. It looks like it's shaping up to be a great place to be!